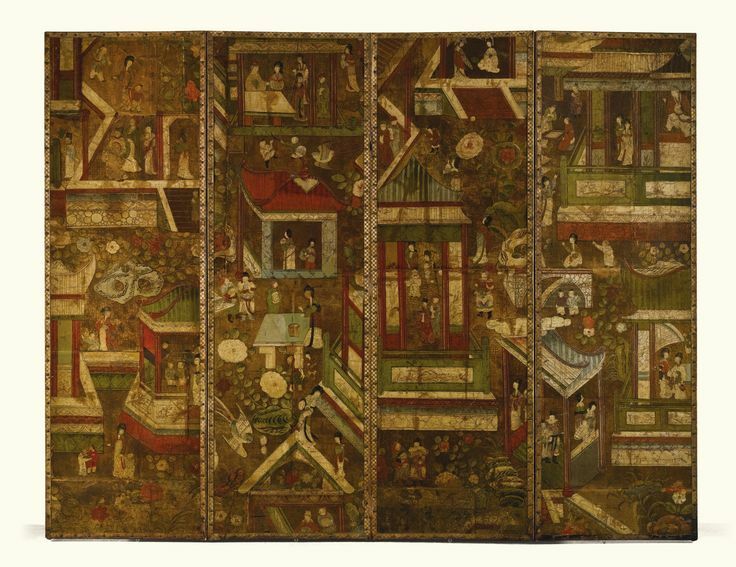 A Chinoiserie polychrome and gilt four-fold leather screen, probably German, circa 1720. Estimate 8,000 — 10,000 GBP. Photo Sotheby’s. decorated with noble ladies and children in daily activities surrounded by birds and flowers, on a gilt ground,reduced in size and remounted – 206cm. high, 264 wide; 6ft. 9in., 8ft. 8in. Notes: The widespread fashion for Chinese objects that sweptEurope in the late 17th and early 18th centuries influenced not only ceramics, furniture and textiles but also the production of leather which developed in Northern Europe under Spanish influence. England, the Netherlands and the German territories embraced leather as a decorative, practical, solid and reasonably priced material and Chinoiserie screens became particularly fashionable for themed rooms in this style. The designs for these Chinoiserie leather screens would often emulated those made of real lacquer, as in the case of the present lot which replicates designs seen in contemporary Coromandel lacquer screens, further enhanced by over-scaled flowers, which seems to be a particularly German feature.